It's here!!!!! Finally, the reveal of the littlest Beach House Brat's room makeover. There's nothing like a three and a half year old, still sleeping in a cot to get one motivated. Yes I know I'm a terrible mother.....I was a fabulous one until I had kids, if that counts!!!! Now to say the budget was tight here is an understatement. It was basically zero. My darling mum bought the Hemnes bed from Ikea. And of course it's love. You know my feelings on that little Nordic necropolis...... I would live there if they'd let me!!!! Mum's generosity was no doubt because she felt sorry for the Beach House Brat still looking through the bars of the cot longingly. The new bed has come in handy for holiday sleep overs too. Number one son has seconded it when his friends stay. I offered to hit granny up for another one for his bedroom, but he said he didn't want one. Why would you when you can use your sister's I guess. He kind of wants a New York loft look for his bedroom makeover and a Nordic daybed just won't fit the bill for him. Now everything in this room is repurposed except for the bed as explained and this quilt, the bunting and the matching cushion on the bed. I found those in a cute little country store, when we recently passed through Bendigo in Victoria's goldfields, on our way back from Melbourne. Together the lot was $120 and I couldn't resist. I had some Christmas money to spend, so it's not like it came out of the tight family budget we are currently on. I spent my Christmas present on my daughter, but as you really know, this makeover probably makes me even happier than her, so why not?. But if she's not as happy about this room as I am, well it's a pretty close second. The cubes, I styled and showed you some time ago, and you liked them alot, but until now that was the only side of the room I could reveal. Of course I forgot to take before shots. I do that alot......hopeless. But it has been done in stages so it just never occurred to me. Dah!!!!! The art works in the gallery, are all pictures I've had stored in boxes under and around the house. This is the start of a gallery wall. It's my first one and I kinda like it. I have been looking at sales for the first letter of her name to include here, but as it is the letter 'L' for LOVE I can never find it on sale. Must be the most popular letter. I made the love birds art over the bed. It has been very popular on Pinterest and was featured on Tater Tots and Jello, which I am very grateful for. There's my favourite cushion find. The ruffle cushions from K mart, down to $5 last time I looked. They made it into a few Christmas stockings to great effect. 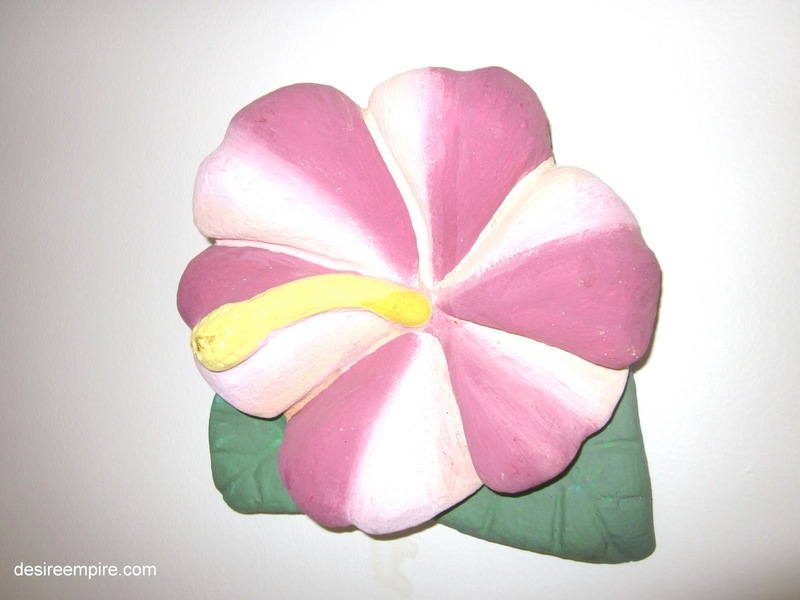 The plaster cast hibiscus I have had for a million years. Again my lovely mum gave it to me as a house warming pressy when I moved in with Mr Beach House all those years ago. 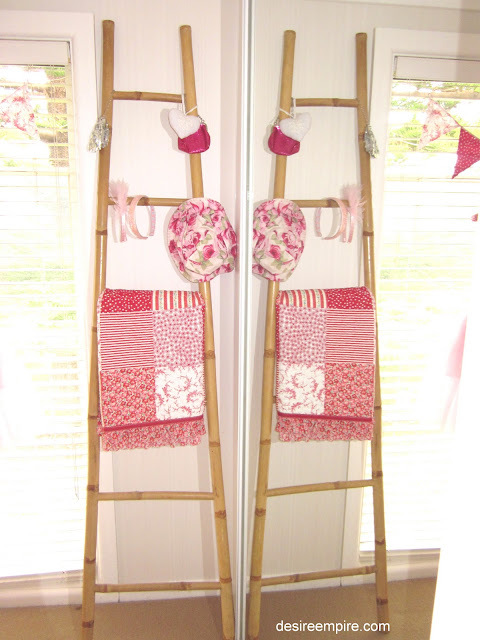 I had to be creative with the art work, which I love lots of in a room by the way, I used the beach babes sun hats, her little shiny play purses to hang from the ladder. I used old china and pretty jewellery. You don't need lots of $$$$$ to make it rock. Just use what you have, you'll be amazed at how it all comes together. 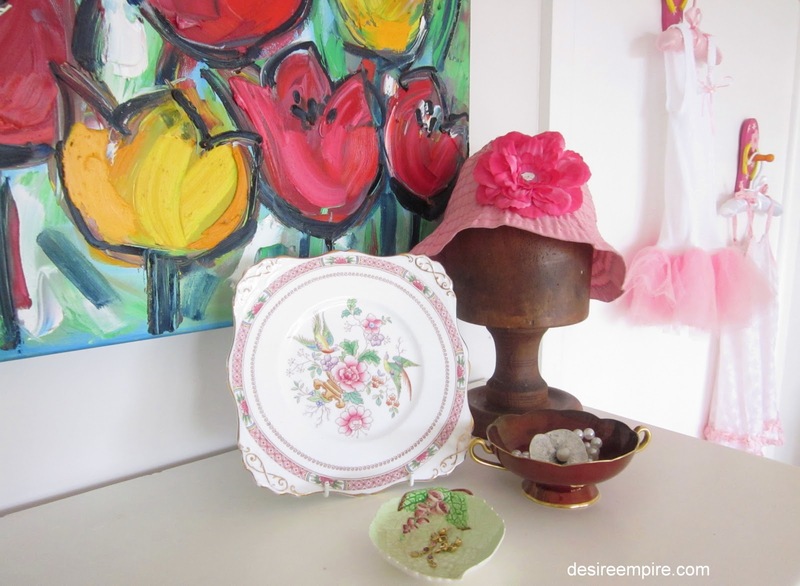 The shaggy pink rug was a roadside find, now Nappy Sanned for days...it came out as new. The Queen Anne chest of drawers was once my grandmothers. It's times like these I'm so glad mum never throws anything out. 'You are kind and important and really beautiful' and then she broke in and started to sing 'But sometimes a little bit naughty, but now I'm good!' She is so worth it!!!!!! Such a lovely room. Love it. it looks beautiful carolyn! love the white bed..it would be a be great for a day bed as well. love the drawers in there too! 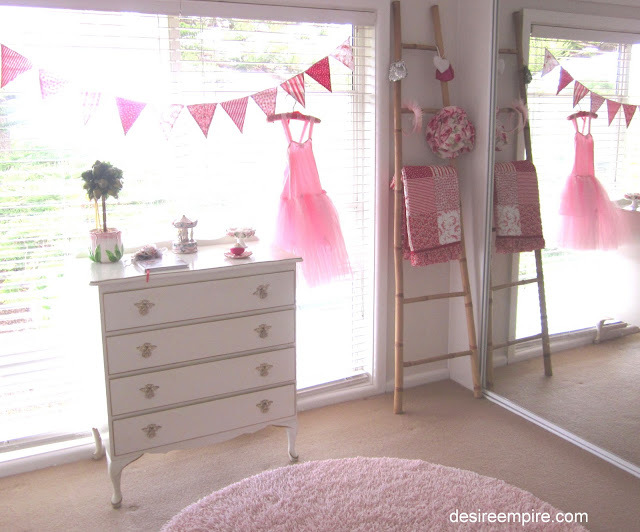 What a wonderful room with all the things a little girl loves. I know a couple of gals who would very much like to spend time here! Every little girls dream room ... just delicious! You have sure created a very attractive and lovely room. Yah right, every little girls dream room. I love the style, the color, the decorative stuffs, everything about it made it exactly perfect! Very ideal! 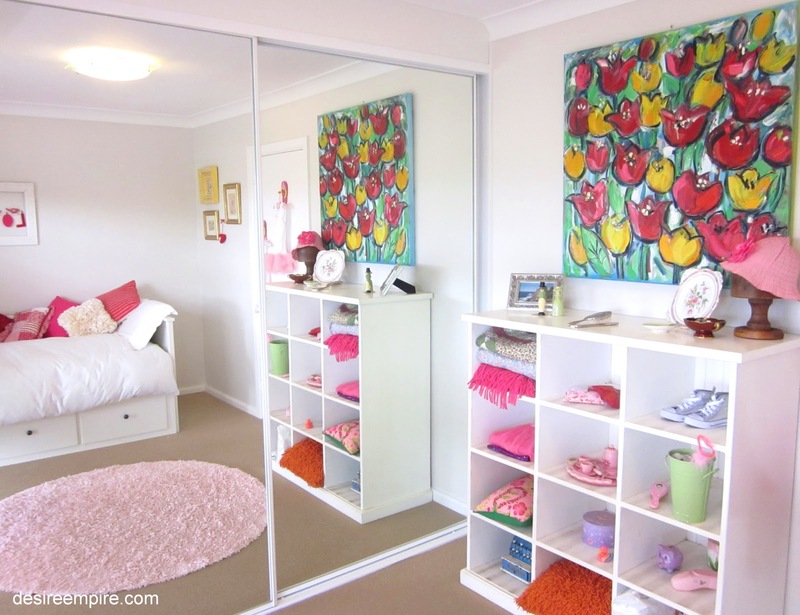 I would have fainted if I had a room like this all to myself when I was growing up with 3 sisters! It's a most beautiful room. thanks so much for the link to the WWI Anzac day in France on your blog. I do not know much about WWI! My great uncle was born in Wales. I just recently found out about him. I love history. 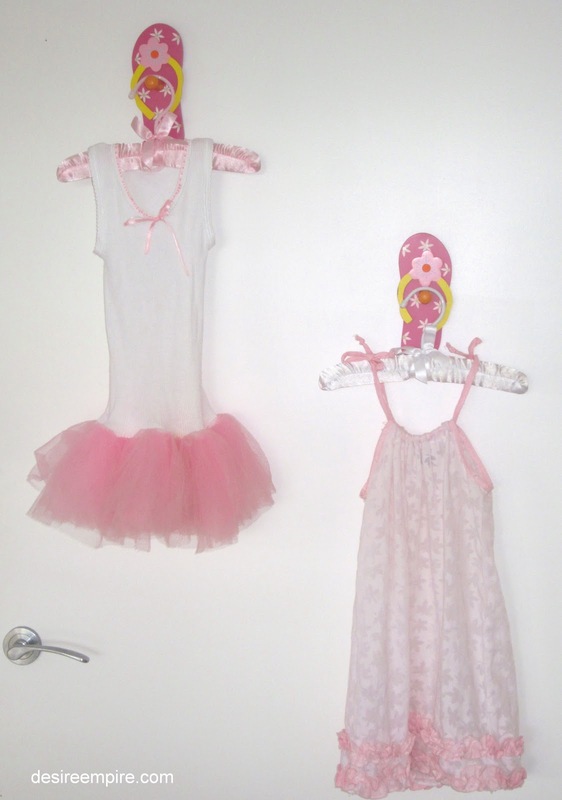 That adorable shaggy pink carpet is just calling for bare feet! What a beautiful room - you've done a lovely job, especially with all the gorgeous artwork! Such a pretty room for a pretty little girl! The tulip art is amazing, too! Love all the shades of pink. That room is just beautiful!! It would be my middle daughters dream to have a room like that!! Well done! So cute! I would love for you to share this over at my Monday linky party. wow, looks totally different. I love it!! well done you!!!! What a beautifully sweet room! I love...well pretty much everything. The story of you on the floor with your little one is precious. Congrats on a room well done. Every little girl should have a bedroom as lovely as that! Truly inspiring and I know your little princess must be so proud of her mommy for decorating her special place as pretty as can be! Thank YOU for participating in our Show Off Your Cottage Monday and bringing us here! It's a little girl's dream! It's so pretty and well done! Thanks for following and I'm your newest follower too! OMG Carolyn this room is just divine. It is every little girls dream room and I love it and I want it and it is perfect and I soooo have to leave now because my hubby is going in to be desexed tomorrow and as I have 3 boys and no girls my ovaries are punching me from the inside and screaming at me - GIVE ME A GIRL GIVE ME A GIRL so she can have a room like this! Her room turned out so very cute. Love the pink! I'm motivated now, since I've been unpacking and trying to organise and decorate and my husband keeps stressing about how much stuff we've got and that I have to get rid of things and I'm not allowed to buy anything else, and it's all very boring and depressing and I'm not going to take any notice! 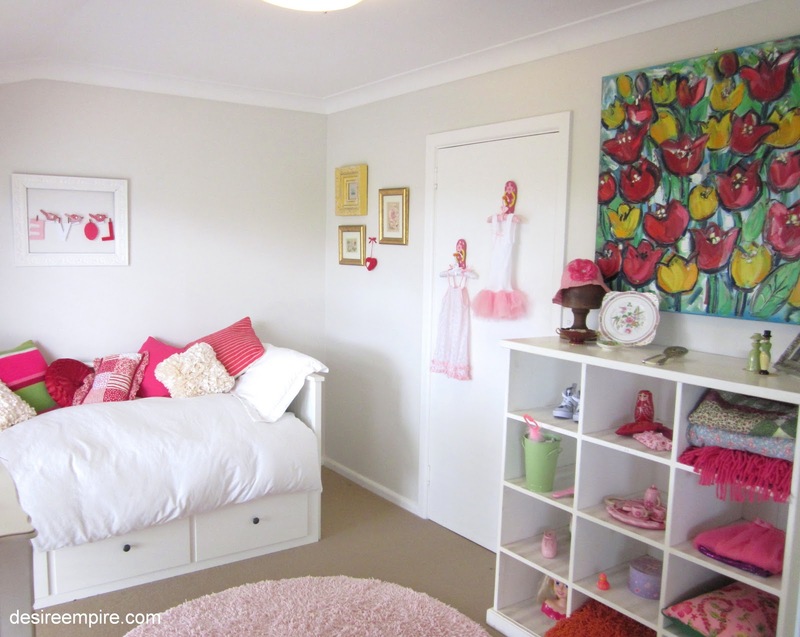 But it was lovely to see your daughter's room and the fact that you managed to make it look so pretty and inviting on a small budget. There's hope for me yet. 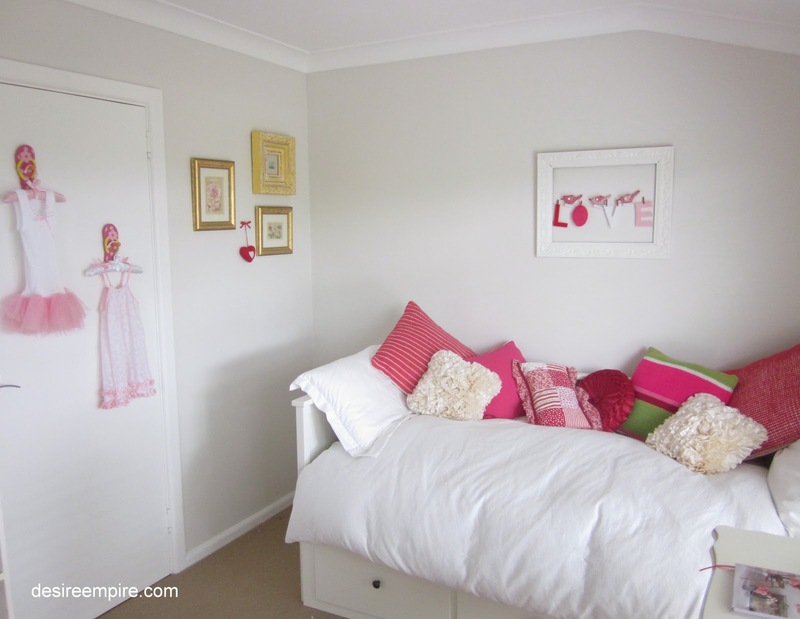 Such a sweet room for your daughter! Love all the pink details and the ladder in the corner! Oh we were all wonderful mothers before we had kids, weren't we? I must have been, because I thought I was fully qualified to judge others in their parenting endeavors. Now I am THAT mom with the kids screaming through Wal-Mart. :) The room is TOTALLY stunning. You would never look at it and think "budget room." Well done! What an adorable girl's room. Your little girl must feel like she's in heaven when she's in there. 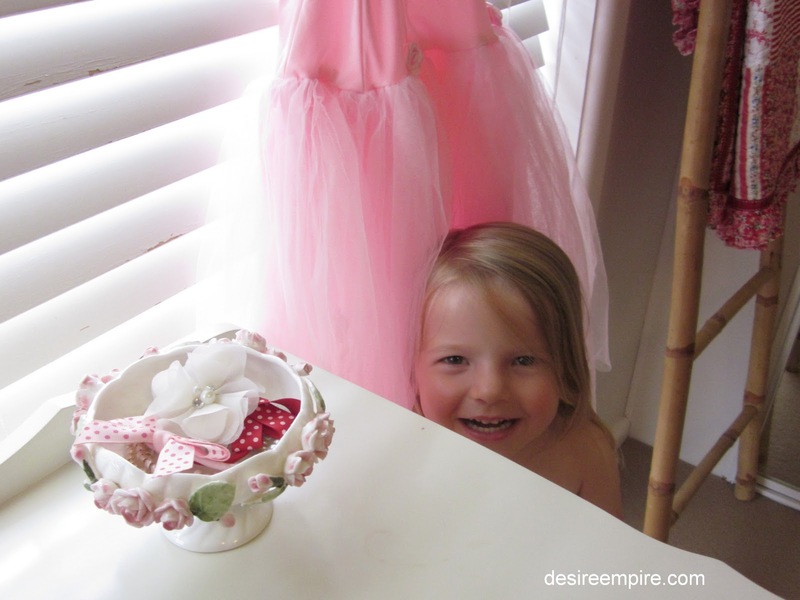 What an adorable room that you've created for your cute little girl! The framed "love" is terrific, and I also love the banner in the window, and those pretty pink quilts. Great job!! How precious!! And the room is darling too. What a very fabulous room. Any little girl would adore this. Pinkalious for sure!!! I just love this room. Everything about it is perfect. I hope you will come and link up to my party with this post (if you haven't already). Seriously beautiful!! So many darling details and the pops of pink against the white are fabulous. I love the banner and that ladder in the corner is perfect! Thanks so much for sharing this at Inspiration Friday this week! I've so enjoyed my visit here today, this is a beautiful room! She is a lucky girl, but sounds like you are luckier! Bright, happy, darling room for the cutest little Beach Brat I have ever laid eyes on! So adorable!! 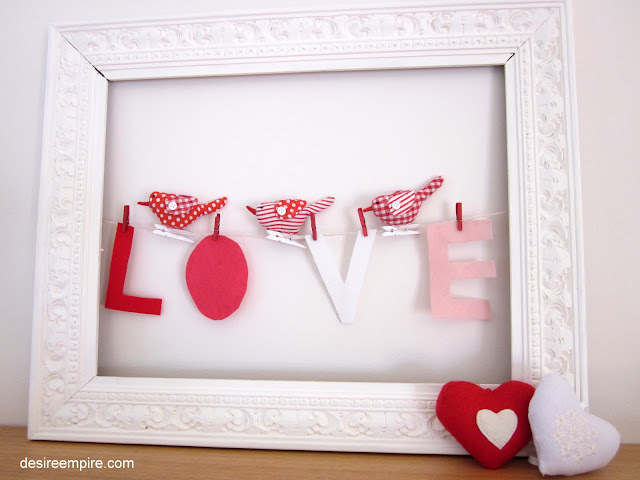 I love the rug & the framed "love" so creative and cute! What a beautiful and girly room! Wow, what a great room!! I can see why your daughter and you love it. Thank you for sharing it at Sharing Saturday! Thank you for linking this fabulous post to Potpourri Friday! What a beautiful room. I still need to get motivated to do something in my daughter's room. Poor thing still has 4 empty white walls. Thanks for the inspiration !! Fabulous, budget or no budget! It's a great room! I worked on a little girls room this weekend. I shared a bit of it today, come check it out. Far out, I love your house. Do you need housemates? ;) Well done. 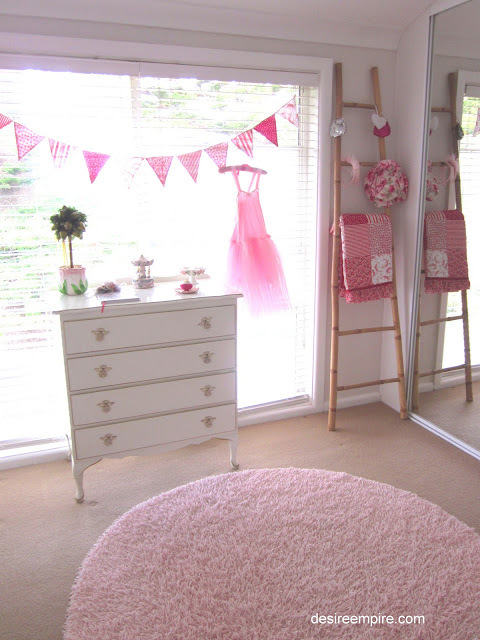 What a sweet room for a sweet little girl! Thank you for joining me at Home Sweet Home! Hi Carolyn! You are featured today at Potpourri Friday! What a sweet room! Great job repurposing...and your daughter is lucky to have such a sweet mom! Her room looks so great! And that bed! It looks so comfy! I'm getting sleepy just looking at it! That is just darling! Truly special ... would you like to share at our multi-blog "Imagine the Impossibilities" link party? I think everyone would really enjoy it as much as I! Yay! Thanks for linking up your projects! Love them all! 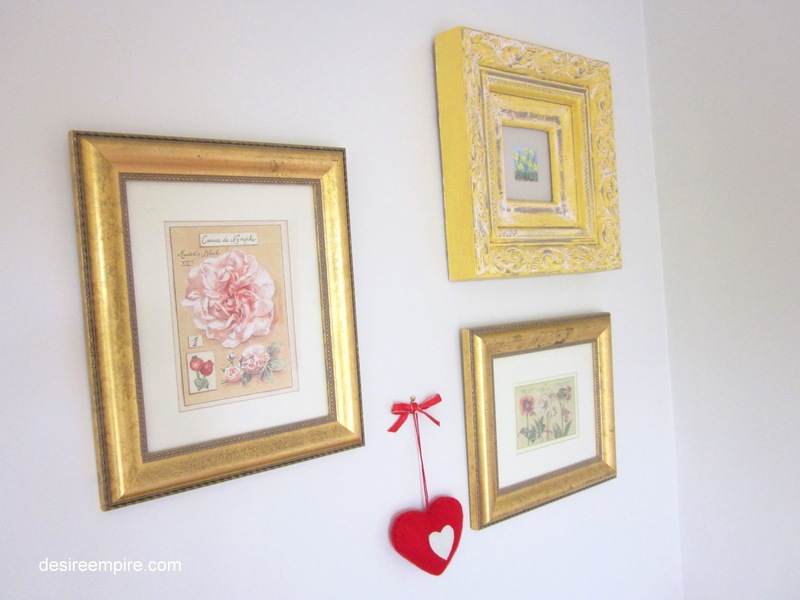 This is amazing and has given me some great inspiration for my daughter's new room! I've pinned this on Pinterest! Thanks for sharing! This is so awesome! And I can totally relate, I am a wonderful mother, but don't have any kids. :) Congrats on the space, it's very dreamy. Thanks so much for linking up to the challenge. I'm now your newest follower. 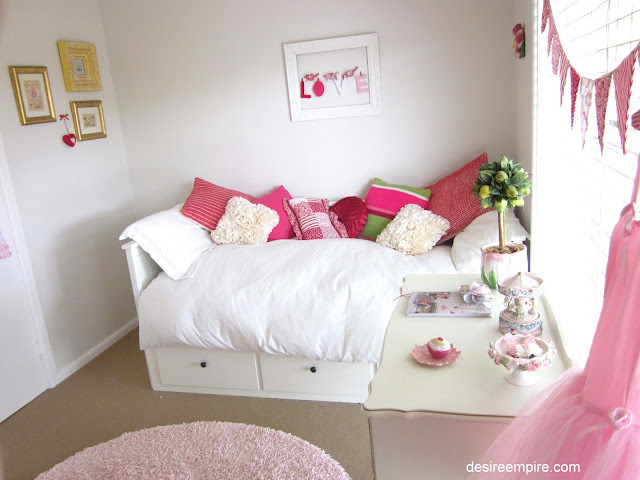 such a cute and cheerful and happy room! love fresh look! Ok, you can see I am posting everything late, because I only found your blog TODAY, lol! But I couldn't leave your little girls room "uncommented", lol! Adorable!!! I am actually helping a friend to decorate her daughter's room, I will show her your room as an inspiration! Your room is so pretty! What little Princess wouldn't just love to be in there. I have this linked to my children's rooms post too today, well done! 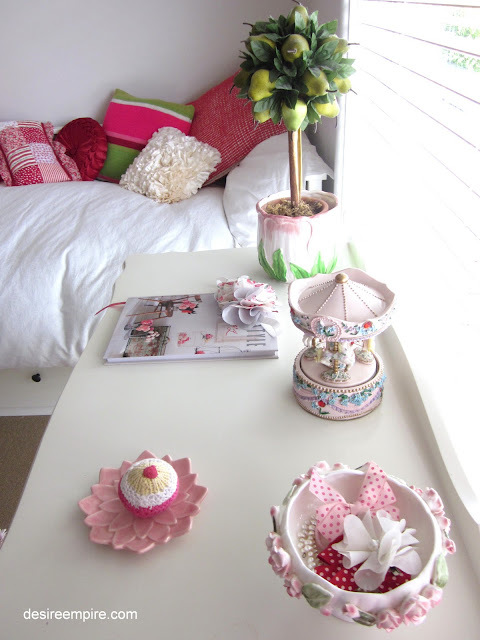 really pretty room....my little girl is nearly 3 so soon time to decorate the new room....thanks for some great ideas! Hi Carolyn - popping over from Tatertots & Jello! I think you did an amazing job on the room. I never would have guessed that you had a tight budget - it is beautiful! !